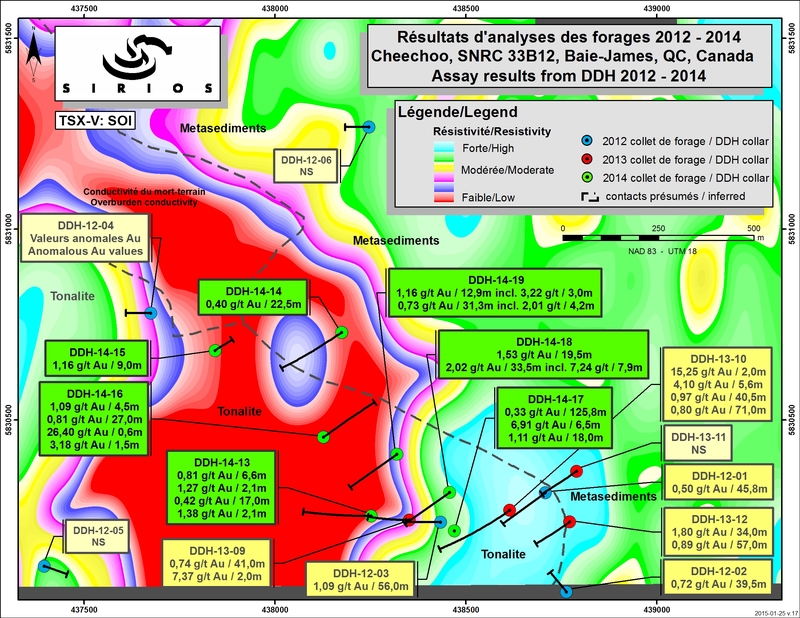 QUEBEC – Two distinct gold zones were intersected by drill hole No.19 last fall at the Cheechoo property operated by Montreal’s Sirios Resources. The first zone assayed 1.116 g/t Au over 12.9 metres and included 3.22 g/t section 3.0 metres long. The second zone graded 0.73 g/t over 31.3 metres, including a 4.2-metre section at 2.01 g/t. The project, located in the James Bay region 800 km north of Montreal, is owned 45% by Sirios and 55% by Golden Valley Mines. Sirios said that results from hole No.19 shows that the gold zones intersected by holes 10, 17, 18 and 16 seem to extend along a strike length of more than 450 metres and remain open in all directions, including depth. More closely spaced holes will be needed to delineate the continuity and orientation of these zones. A map that includes the location and grades of the Cheechoo drill holes is available by clicking here.